Kiri wood Japanese meal trays. Offered by . Distressed dusty pink/red paint over metal. Multicolored double shade with wood beads. Updated wiring and hardware. 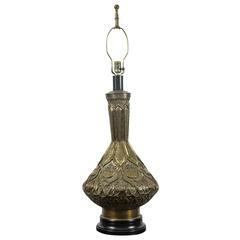 A small painted ceramic table lamp with ebonized black wooden base. Updated and “Americanized” hardware. Custom black paper shade with blue interior. A pair of 20th century blue and white vases featuring cherry blossom motif. Turned into electrified table lamps with ivory shades. 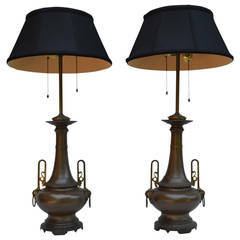 Modified pair of bronze urn lamps. Amazing patina and beautiful black shades with gold lining silk, included. 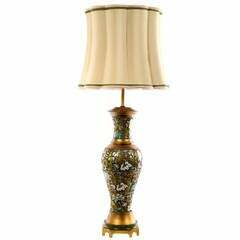 A gilt bronze cloisonné lamp topped with an embroidered silk shade, made in China during the middle of 20th century.